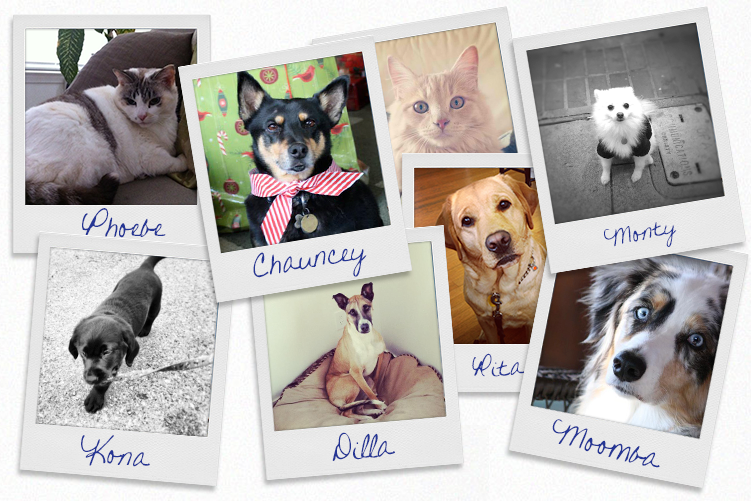 ‘Tis the season holiday cards and newsletters, and MagCloud is here to help! As we’ve discussed before, MagCloud’s print-on-demand capabilities offer a great way to produce personalized holiday communications on an affordable budget. With the premium 80# cover stock we use on all sizes of our Flyer and Pamphlet products, combined with the commercial quality of our full-color digital printing, you can rest assured that your message will look professional and polished whether you are keeping in touch with business clients or corresponding with family and friends. We have a number of businesses and organizations that use MagCloud for their newsletters year-round, and the holidays are no exception. As we near the end of the year, it’s a great time to connect with clients and members to update them on the prior year and get them thinking about the year to come. If you own a photography business, for example, you can use this as an opportunity to highlight some of your best work from the past year and remind previous customers about the other services you offer. Or if you are in charge of member communications for a nonprofit organization, now is a great time to highlight the work you’ve done in 2012, and encourage member participation in the new year. No matter what business you are in, MagCloud’s 8.25″ x 10.75″ Pamphlet product is the perfect format for your holiday newsletter with four pages for full color images and text, a clean half-fold binding, and a professional-weight paper stock, all for as low as $0.60 per piece when you order 20 or more. Simply create your PDF in the software of your choice, upload it to MagCloud, and order as few or as many copies as you’d like. We can even take care of the distribution of your newsletter for you, and drop-ship copies of your newsletter to an address list at no additional cost. If you don’t feel like a long-form newsletter is the right fit for your business, you could also create and send a custom greeting card instead. MagCloud’s 5.25″ x 8.25″ Pamphlet format fits perfectly into A9 envelopes, which can be found at any paper or office supply store, and the 80# cover stock that these products are printed on gives them a great professional feel. For only $0.48 per piece when you order 20 or more, this Pamphlet format offers an affordable way to incorporate your products, employees, or the work that you’ve done into your holiday greetings, along with your own branding and a more personalized message, rather than sending a generic card to your clients or organization members. Of course, businesses aren’t the only ones that send cards and newsletters during the holiday season. Holiday newsletters from families have become the norm in recent years as a way to update friends and relatives on the family’s activities over the prior year. Combining these updates with family photos into a single printed piece is a great way to streamline your holiday communications, either as a double-sided Flyer or using one of MagCloud’s four-page Pamphlet products for additional space. 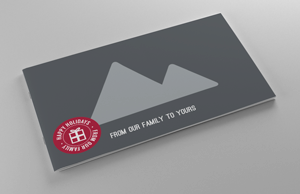 If a newsletter isn’t your style, how about a custom greeting card. MagCloud’s 5.25″ x 8.25″ Pamphlet product makes great half-fold cards while the 5.5″ x 8.25″ or 8.25″ x 5.25″ Flyer works well as an oversized postcard. Both fit perfectly into A9 envelopes, and at only $0.24 per piece for 20 or more of the Flyers, or $0.48 per piece for 20 or more of the Pamphlets, both offer a blank slate to create affordable holiday greetings that are unique to you and your family. Whether you create a collage of family photos or scan some of your children’s artwork for the cover of your card, you can be sure that it will be met with a smile upon arriving at its destination. To help you design your holiday newsletter or greeting card for printing through MagCloud, below are links to templates in a variety of formats and software programs. Each link below will take you to a preview of a publication created with that template on the MagCloud site, where you’ll find links in the description to download the corresponding template for a variety of software programs. You can also find a number of letter-sized newsletter templates in programs like Apple Pages, or online at office.microsoft.com for Microsoft Word and Microsoft Publisher. These work well with MagCloud’s 8.25″ x 10.75″ Pamphlet and Flyer products. After you’ve designed your file, be sure to follow the instructions on our Getting Started page to export your PDF. *Keep in mind that if you are using the 5.25″ x 8.25″ Pamphlet for your greeting card and want a top-fold, you will need to upload a PDF with the design rotated, in the same way you would if you were creating a calendar. Whether it’s for your business or your family, the holidays are a great time to send an update to friends, family, and colleagues. Here at MagCloud we think the best way to do that is with a beautifully designed print piece, so we’ve created a few holiday newsletter templates to help you get started. Once you’ve personalized your template of choice by adding your own photos and text in Adobe InDesign, Apple Pages, or Microsoft Word, follow our instructions to export a MagCloud-ready PDF file and then upload it to the MagCloud website to place your print order. We can even help you ship a copy of your newsletter to everyone on your address list with our Ship to Group feature. You can also opt to make your newsletter available as a digital version to share virtually if you don’t have someone’s shipping address. 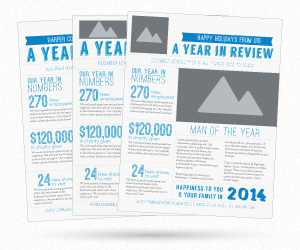 Send your customers an overview of what you did in 2013 and let them know what they can look forward to in 2014 with our holiday business newsletter template. This two-page template was designed for MagCloud’s 8.25″ x 10.75″ Flyer, a double-sided single-sheet product with optional UV coating, and you’ll be able to print this newsletter for as little as $0.30 per piece when you purchase 20 or more copies. When you download this template you’ll be able to choose from three layout options: no logo, a rectangular logo, or a circular/square logo. When you are ready to export your file, be sure to follow the PDF export instructions in our Software Specific Instruction Package for your software of choice, available to download on our PDF Design Resources page. 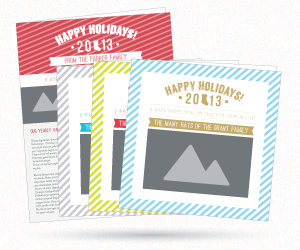 Let your family and friends know what you’ve been up to the past year with our holiday flyer newsletter template. This short and sweet two-page template is available in three color combinations and was designed for MagCloud’s 8.25″ x 10.75″ Flyer, a double-sided single-sheet product with optional UV coating, and you’ll be able to print this newsletter for as little as $0.30 per piece when you purchase 20 or more copies. After you’ve personalized the template with your family’s photos and text content, export your MagCloud-ready PDF using the instructions in our Software Specific Instruction Package for your software of choice, available to download on our PDF Design Resources page. 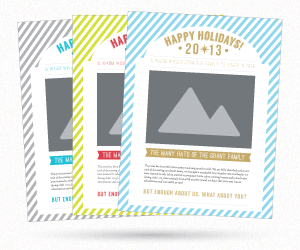 If you’re looking for a little more space in your holiday newsletter, check out our pamphlet templates. These four-page templates were designed for MagCloud’s 8.25″ x 10.75″ and 8″ x 8″ Pamphlet products, which have a half-fold binding and can be printed for as little as $0.60 per piece when you purchase 20 or more copies. The 8″ x 8″ version is available in the same three color combinations as the Flyer template. After you’ve personalized the template with your family’s photos and text content, export your MagCloud-ready PDF using the instructions in our Software Specific Instruction Package for your software of choice, available to download on our PDF Design Resources page. Be sure to select your chosen pamphlet size from the top of the page (8″ x 8″ or 8.25″ x 10.75″) before downloading the Instruction Package. If you want to send even more photos to your family and friends this holiday season, we’ve created a longer photobook newsletter template. This template was designed for MagCloud’s 8.25″ x 5.25″ Digest product, and includes 16 pages to place your photo and text content. If you want to fill up all 16 pages, a print copy of this photobook will cost you just $2.56. You can also choose to delete pages in the template for a shorter 12 or 8 page booklet, or duplicate pages to make an even longer photobook and take advantage of our perfect binding option. When you are ready to export your file, be sure to follow the PDF export instructions in our Software Specific Instruction Package for your software of choice, available to download on our PDF Design Resources page. The holiday season is almost upon us! If you’re thinking of ways to cherish memories, gift your friends, family or clients, consider creating customized calendars! Every year, we share new ideas or templates for calendars and this year is no different. You can easily create calendars to send to loved-ones or to have clients remember you year-round by dropping our monthly grids into one of our standard templates in your favorite software. Simply put your own personal images on the cover, left-side pages and back (remember to rotate them on their side like the image below) and insert the grids on the right hand pages in order. We’ve included 13 months (December 2013-December 2014) so that you can easily create a 28-page saddle-stitched calendar. Your final PDF should be on it’s side, like this. Get started with a Blank Standard Template for your favorite software HERE. Download the monthly grids as images HERE. Bonus! Download monthly grids as images for an 8×8 Square calendar HERE. What type of calendars will you create? Tag us in a Tweet, Facebook post, or Instagram with a picture of a 2014 MagCloud calendar you created for a chance to win 5 free copies! Calendar must be received by 10/30/2013 12 a.m. PDT. U.S. residents only. Whether you’re planning a big family vacation, or a small weekend staycation during the summer break, wanderlust seems to be an epidemic during warm summer months. In the Travel and Vacation Category of the MagCloud storefront, you can find all sorts of great publications to help inspire your travel whims, help you plan your trip, or inspire you to document your family adventure when you come home. And if you don’t get to travel anywhere this summer, you can always enjoy a good read on your lunch break and take a mental vacation. So in honor of our own summer wanderlust, today we’re featuring some of our favorite travel-inspired publications on MagCloud. little Indiana: Where to Stay, Play, and Eat in Small Indiana Towns (population 15,000 and less). Just like littleIndiana.com, the magazine takes things to a whole new level! Find information about Indiana’s restaurants with outdoor seating, mom and pop ice cream shops, a young couple that renovated a building and restored a downtown, memories of summer from a town that no longer exists, a business on the brink of closure, and plenty more! Don’t miss regular features like “From the Hoosier bookshelf” and the Indiana trivia crossword puzzle. To & From Magazine merges travel and lifestyle. The July edition of Africa’s premier Travel Trade Journal features Kenya, plus articles on Business, Conservation, Events, Hospitality, Legal and Marketing issues. A quirky and colourful guide to the BVI for residents and visitors. This books uses tongue-in-cheek commentary and bubbly design elements which keep the reader entertained and at ease when the time comes to move to Nature’s Little Secrets. This handy guide book also provides step by step instruction for several unfamilliar practices and/or procedures visitors often face while in the Virgin Islands. Don’t just read about others’ adventures, publish your own. Rather than let those sunny summer memories fade with your suntan at the end of the summer, start planning now to chronicle your summer adventures and photos into a cool summer recap magazine, or travel photo book printed through MagCloud. You can create a personal memento in magazine format to easily share your memories with family and friends in print and digitally. Save and scan ticket stubs, itineraries and after your trip, compile all of your pictures and memories into a Square photo book or scrapbook using Apple Aperture or Photoshop to share with your friends and family! If you’re not a big designer or super savvy with software–not to worry–you can try out our partner Poyomi’s on-line tool for photo book design. Happy Camera Day! There’s no better time than the present to get inspired to publish your own photography creation or cruise over to the MagCloud Shop and check out some amazing photography magazines. In honor of National Camera Day, we’re highlighting a few of our favorite photography-centric blog posts and some great publications on MagCloud dedicated to photography in all of its forms. Whether you’re a mommy-tog, a professional wedding or portrait photographer, a hobbyist or just a fan of beautiful imagery, you’re sure to find cool ways to use MagCloud or a publication in the Photography category that fits your interest. Still needing some inspiration? Check out our Q&A with photographer Holli True. Denim+Grace is a Photography Magazine created for Photographers. The encore issue contains 94 pages of marketing, branding, posing and inspiration. With artists working in genres ranging from weddings to boudoir, children to seniors, and even iPhoneography- there’s sure to be something inspiring and enlightening for even the seasoned artist. Beyond our featured photographer articles and artist pictorials, the June 2013 issue includes an inside look at a new studio, a first-hand experience from an NYC Workshop with Sue Bryce, the highs & lows of being a business owner and so much more! Lemonade and Lenses’ second annual senior issue. Featuring Articles by Angela Richardson, Meg Borders, Brittney Zambrowicz, Amanda Holloway, Kalyn Yeager and Leslie Kerrigan. Now available, Mozi Magazine’s Wedding Issue! This beautiful new issue is loaded with astounding imagery and inspirational content from some of the industry’s most admired artists, including Simply Bloom, Ben Sasso, Bobbi+Mike, Julie Paisley, Zach and Jody Gray, Totally Rad Actions, Design Aglow, Fotofafa, and more. Senior Style Guide Magazine Issue 5 features educational articles from Lindsay Horn, Brittni Shroeder, Kody Hadja, Andi Artze, Stephanie Newbold, Kristen Weigel, Feuza Reis, Lexi Vornberg and Addie Gibbons. DCist Exposed is the Exhibition Program for the 2013 DCist Exposed Photography Show. Lost Freedom is an inspirational magazine featuring young and inspiring photographers, writers, and artists. What’s your favorite photography publication on MagCloud? Share it with us in the comments!